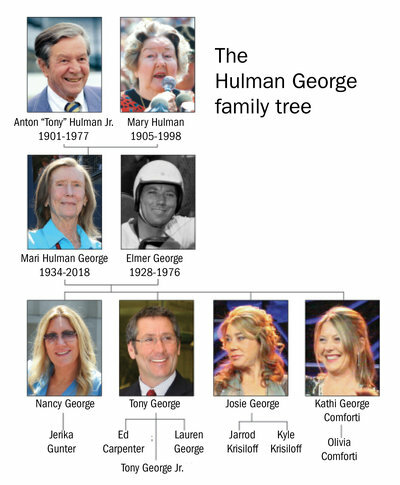 Tony George elevated to chairman of board of Hulman & Co.
Mari Hulman George, the matriarch of the family that owns the Indianapolis Motor Speedway, died Saturday morning. She was 83. George was the only child of Anton “Tony” Hulman Jr., who bought the dilapidated speedway for $750,000 in 1945 and turned it into the most prominent race track in the country. She served in various leadership roles at the track, most recently as chairman emeritus of the IMS board. "Mari Hulman George was one of the nicest, most gentle people you would ever meet, but she also was an incredibly influential leader in American motorsports and the state of Indiana for the last 60 years,” Mark Miles, president and CEO of Hulman & Co., said in a statement. “Generations of Hoosiers have benefited from her tireless charitable work, and her commitment to animal care is exemplary and a mirror of her kindness,” Miles said. “We extend our sincere condolences to the entire Hulman-George family and will miss her greatly." Heartbroken at the passing of Mari Hulman George, who touched the lives of millions through her passion for auto racing, stewardship of IMS and decades of compassionate philanthropy. Hulman & Co. holdings go far beyond the speedway. They include investments in banking, real estate and oil production and manufacturing Clabber Girl products. In addition, the company owns the IndyCar series, the racing league that runs the Indianapolis 500. George had four children with her late husband, Elmer, and most are involved in the speedway or racing in some way. George was best known for her role at the track, where for years she called out, “Gentlemen, start your engines,” at the Indy 500. IMS President Doug Boles said George’s impact will be “felt at IMS and across Indiana for years to come." She launched numerous philanthropic efforts, including benefits for Indiana Special Olympics and field trips for Indiana's schoolchildren. She focused on the arts, health care and, in particular, animal care. In 2001, the Indiana Department of Homeland Security renamed its search-and-rescue training area at Camp Atterbury the Mari Hulman George Search and Rescue Training Center, recognizing Mari’s contribution to the care of animals displaced and affected by disasters. Condolences poured in from across the country. Former IndyCar driver and entrepreneur Sarah Fisher tweeted that, "Mari was just an incredible woman all around. A leader in our sport and truly an icon." Former IndyCar and NASCAR driver Tony Stewart tweeted that racing "is filled with passionate people, but you'd be hard pressed to find anyone more passionate than Mari Hulman George. She did so much for motorsports and her community. My heart goes out to the entire Hulman-George family." Indianapolis Colts owner Jim Irsay wrote on Twitter, "Rest in peace, Mari Hulman George. My heart goes out to my good friend Tony and the entire Hulman-George family. ESPN senior writer Ryan McGee said that, "To an entire generation of Indy 500 fans, the sound of her voice meant it was time to go racing."